For some of us, the holiday season dredges up more feelings of stress and anxiety than it does feelings of comfort and joy. The family gatherings, buying gifts and the travel to relatives: You may have every intention to celebrate, but something is holding you back. Maybe you just can’t wait for it to be January? But it doesn’t have to be that way. You can take good care of yourself without completely unplugging from your family’s ritual and tradition. Perhaps it means skipping an event or two to lower your stress level. Try to find your own way to enjoy family time the way you want to. Talk to a few family member about how you’re feeling. Do you have a trusted family member — maybe it’s that aunt, a sibling, or a favorite cousin — you can confide in? Confide with cheer. Share what’s on your mind and know you’re not alone if you feel stressed or anxious about spending so much time with the family. Make a plan to get away together; go out for coffee, pack your hiking boots, or download some relaxing meditations to help you let go when it all gets to be too much. Sitting on the sidelines can amplify our anxiety. Sometimes our level of satisfaction is directly linked to our level of feeling invested, even though it’s more effort and work. Maybe this is the year you offer to host the family’s Christmas Eve gathering. Or perhaps you only do one part with gusto —,you plan plan the menu, find the centerpieces, or concoct the holiday cocktail. Think about your own interests and energy level, and offer to do something you feel good about doing. You don’t have to spend all of your time with your family. Take a few hours this holiday season, and spend them giving back to your community; volunteer opportunities may be available through local places of worship, homeless shelters, or animal shelters. Be mindful of your own mental health. Only you know your own triggers for stress. If going caroling with the family is going to put you in a sour mood, plan ahead and talk it through with family so they’re in the loop about what could make the activity more enjoyable for you. Maybe hire a car service to drive you to holiday parties or shopping? Maybe this is the year you decide to accept your uncle’s choices and let go of the burden of feeling responsible for his behavior. And if the general hubbub of the season leads to overwhelming anxiety that overtakes your daily thoughts and feelings, stop and reach out for help. Contact the experienced Washington DC psychotherapists at Keith Miller & Associates for an appointment to discuss how you can relieve holiday stress. The kids are out of school, and pretty much everyone in the office is checked out. It’s vacation season. Nearly half (45 percent) of all Americans who vacation do so in the summer months, July more specifically. To Florida or California, DC or New York, the Caribbean Islands or Europe: We go on vacation to escape, to find a new set of scenes to look upon for a week or more. We go on vacation because we think that’ll make us happy, but does it really? The research indicates that people are happiest while planning, or in anticipation of their vacations, more so than while on or after vacation. But of course there is an exception. The only people who have been found to be happier after vacation are those who can describe their time away as “very relaxing.” That’s the way. Take a “very relaxing” vacation to maximize happiness all year round. 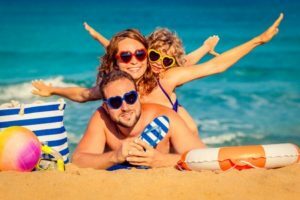 The secret to a very relaxing vacation isn’t traveling to a specific location, or staying at the most luxurious resorts; no, that very relaxing vacation destination isn’t a destination at all, but a mindset. Mindfulness. Defined as “a moment to moment awareness of one’s experience without judgment,” mindfulness enhances the capability of memory; it increases your ability to focus, and lessens emotional reactivity; mindfulness also helps make the practitioner more open to change and increases relationship satisfaction. Take mindfulness on vacation with you. Vacation is fun, sure, but there’s a reason the majority of us feel more excited and happier before departing. That’s because vacation is also stressful. But if you start now, the practice of mindfulness can mean the difference between feeling stressed and being happy, by keeping you aware of your environment moment-to-moment. So on this vacation this summer, truly give your brain a break. Put down your iPhone (or at the very least, turn off your work email). Take a long walk along the shoreline. Do a little yoga. Meditate, or sketch. Try, or do something new. Simply close your eyes and let your senses be overwhelmed by the world around you. Allow yourself the time, the space and the mental clarity to take in the richness of a new and different environment; and you’ll find the key to being happy, happier, and happiest before, during, and after vacation. Can Meditation Help Your Relationship? It is no secret relationships take a lot of work: communication, dedication, trust, and friendship. Successfully navigating these waters also centers around personal mindfulness, that is the act of staying active and present in a situation. Mindfulness allows you to observe your thoughts and feelings from a distance without inherent judgment on the situation. Mindfulness meditation is an excellent step towards improving a relationship. When you are clear within yourself, becoming clear in a relationship is easier and more accessible. The most widely known benefit of meditation is stress reduction. Your body and brain, under great stress, falls into a constant state of fight or flight. Meditation allows you to slow down, evaluate your sense and presence of self, and relax your body. The stress reducing effects of meditation have been known to last several hours following a meditation session, leaving you more relaxed and in control of your body. The impact of your more relaxed state will have an immediate effect on your relationship. When stressed, little things become big problems. Running late, not putting up the dishes, forgetting to return the latest Redbox movie, all of these things can become points of frustration when we are stressed. In a more relaxed state, we are able to better go with the flow and acknowledge that our partners are fallible human beings instead of the perfect person we inadvertently demand they be. 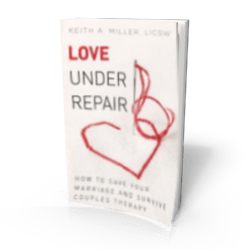 We are able to better communicate and empathize with one another, leading to effective conversations about issues in the relationship or solving misgivings that have occurred. Meditation helps us understand our feelings. Research on mindfulness meditation has shown there is an increase in the activation and size of our middle prefrontal cortex, or the mPFC. Neuroscientists believe the mPFC integrates our higher “intellectual” brain areas with our emotional areas. A well-formed mPFC better connects our intellectual being with our emotional being, resulting in a better understanding and control of our emotions. Being tuned into our emotions, but not controlled by them, allows us to give a calm, rational response to incidents in our relationships. This brings about less misunderstandings and subsequent arguments. We remain in the present and can process what our partner is trying to tell us without letting our defenses flare up. 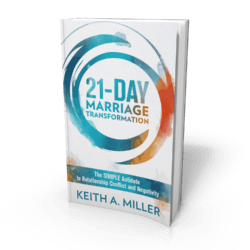 When we enter a conversation from a place of defensiveness, our ability to listen and comprehend what our partner is trying to say diminishes. Our goal becomes to defend ourselves, not work together. Mindfulness meditation helps eliminate this kind of conversation for a healthier relationship. Having this control over our emotional state also helps us better understand our own emotions and what is causing them. Often, we know we feel a certain emotion like anger or sadness, but cannot properly articulate why we feel this way. Why did we react the way we did to a certain situation with our partner? Mindfulness meditation, along with honing our mPFC, allows us to better understand what we are feeling, why we are feeling this way, and shows us a clear path to correcting feelings of hurt. We can speak to our partner rationally, with an in-depth knowledge of our inner self, and work together to correct any misgivings. The professionals at the Keith Miller Counseling Center can help you take the steps towards a healthier mind and relationship with mindfulness meditation. Call us today! Know what happened next? The scientists charged in, validated the benefits of exercise, and now we all do it – and if we don’t, we feel guilty about it. Right now, meditation is at the point where exercise was a few decades ago. 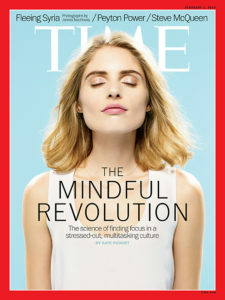 It is, as Time Magazine put it, a revolution in health and mental health. As a result of the new science, meditation is now being shown as effective at performance enhancement for such elite organizations ranging from Google, to NBA teams, and the US Marines. The practice of mindfulness is one that is growing ever more widely talked about. The world is moving faster; stress levels are higher; and more and more people are coming to understand the benefits of meditation and mindfulness. But what are those benefits exactly? The practice—it is, in fact, something that one must practice—of mindfulness has been proven scientifically to improve the physical and mental well-being of all who take the time to stop, breathe, and meditate. Mindfulness can diminish the severity of pain. So much of how we perceive pain is mental; truly, some of it really is all in your head, and meditation can help. A 2011 study published in the Journal of Neuroscience revealed that pain perception is cut nearly in half when the sufferer turned to mindfulness. Not only can the practice of mindfulness make us feel more relaxed and calm in the midst of a stressful situation, science has shown that it’s linked with markedly decreased levels of the stress hormone cortisol. Mindful meditation makes us feel less stressed, because it changes the chemistry of your body. Mindfulness increases our ability to feel empathy. One study conducted at Northeastern University College of Science found even a brief period of mindfulness improved participants’ levels of compassion by as much as 50 percent; likewise, a different study published in the journal PLOS ONE, the practice of meditation showed more brain activity in regions linked with empathy while meditating than when not meditating. Mindfulness can make us healthier. Researchers from the University of Wisconsin School of Medicine and Health found that people who engage in mindful meditation miss fewer days of work related to respiratory issues. When they do fall ill, those with mindfulness practice experience shortened and less severe symptoms. Mindfulness is beneficial, even when you’re not in active practice. Your brain’s emotional processing center, the amygdala, is “exercised” every time you meditate. The result is that your brain’s distress tolerance threshold (your “window of tolerance) is expanded, even when you’re not meditating. If you’re stressed or anxious mediation expands your emotional window of tolerance as much or more than anti-anxiety medication. Keith Miller specializes in mindfulness-based psychotherapy for anxiety and stress. There’s no better way to ease the stress and anxiety that wreaks havoc on your daily life than with a little mindfulness and meditation. But shutting out the distraction, noise, and interruptions can be difficult, and it’s for that reason that smart software developers everywhere have — you guessed it — developed an array of meditation and mindfulness apps that range from free, to just a few dollars to help you gain a little inner peace, wherever you are. There’s a mindfulness app for that. The Mindfulness App from MindApps can help reduce your stress and increase your wellbeing — in just 20 minutes today. Great for everyone, including beginners and experienced practitioners of meditation and mindfulness, The Mindfulness App is easy to use. Just choose between different types of guided meditations, or meditate in silence, and enjoy the scientifically proven health benefits that come along with the practice of mindfulness. We’re big proponents of practicing mindfulness here at our psychotherapy practice in Washington, DC, and there simply aren’t enough good things to say about this particular meditation companion app. It’s all in the name of the product, really. Stop. Breathe. And think. The free app features a varied sampling of mindfulness exercises, ranging from short to long: Got just five minutes to clear your head? Or want to tune the world out for an hour? Stop, Breathe & Think is your go-to. These apps sound great, and all — but they won’t help you if you aren’t sure what mindfulness is, or why it’s surging in popularity as a helpful practice for fitness and mental health resiliency. Mindfulness is scientifically defined as “state, process and practice of remembering to observe moment-to-moment experience with openness and without automatic patterns of previously conditioned thoughts, emotions or behaviors.” It’s been shown to offer a variety of health benefits, including improved sleep, decreased anxiety, and turning on genetic markers of immune-system functioning . More than anything, mindfulness is a practice — a habit — that allows you to experience more of life in its fullest. To learn more about mindfulness and meditation, and how its practice can improve the quality of your life, contact Keith Miller & Associates (with offices in Washington, DC & Bethesda, Maryland) for an appointment today. Anxiety (or panic) attacks are — well — they’re awful. 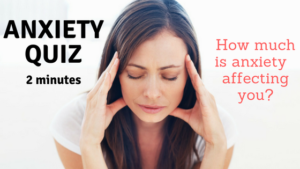 Anxiety attacks are periods of intense anxiety, or panic that often occur suddenly, and with no warning. They affect the mind, but more so the body, and can cause extreme fear for the sufferer — especially those who’ve never before experienced such a thing — as the symptoms mimic those of other, more severe maladies. To use the more technical term, a panic attack can be best described as severe dread or distress, often attended by painful physical symptoms that can include dizziness, sweating, a racing heart, chest pain, shaking, or numbness. And then there’s what’s going on inside the mind. A typical anxiety attack will last five to 10 minutes, during which the sufferer will experience extreme thoughts that might lead them to believe they are going crazy, or that they’re dying — none of which is true. Stress. Remember, last week, when we talked about stress, its effects on the body, and the subsequent ‘fight or flight’ response? The same concept applies here. Stress can lead to panic, which leads to a chemical reaction in the body, which leads to feelings of anxiety and apprehension. Panic attacks often seem to come out of nowhere, but they can be triggered: By a lack of sleep; by traumatic life events, such as loss; by drugs, alcohol, or caffeine; or by specific chemical and hormonal imbalances. If you believe you may be experiencing an anxiety attack, take a deep breath, and know that anxiety attacks are highly treatable. Since most symptoms of a panic attack mirror those of a heart attack, most first-time sufferers end up in the emergency room. It’s always a good idea to rule out any physical conditions that might be causing the symptoms of an anxiety attack. 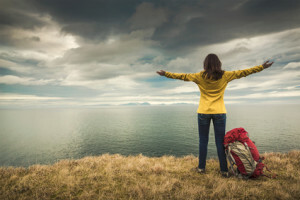 Once you’ve determined that what you experienced in Washington DC really was a panic attack, a few simple lifestyle changes — such as adequate sleep, exercise, and the basic skills of mindfulness (detailed below) for as little as 10 minutes per day — will greatly reduce the severity of, or eliminate panic attacks altogether. What is the best way to treat an anxiety attack? The physiology of stopping an anxiety attack is incredibly simple yet profoundly elusive in a moment of panic. The scientific reason for a panic attack is this: Your brain and body’s natural defense system — the stress response — shifts into high gear. If you were running away from your neighbor’s pit bull, the major stress chemicals, adrenaline and cortisol, would be needed to help you leap over the chain-link fence fast enough to avoid a nip from the dog. If you were a zebra, once the threat was gone you would mindlessly resume your activities of munching grass. Zebras don’t get ulcers (or have panic attacks), because they have no prefrontal cortex — that part of the human brain which imagines or re-lives the experience of stress. When your thinking cortex hasn’t hijacked your body, your parasympathetic nervous system naturally kicks in, to soothe and calm your body with just the right cocktail of chemicals. This is called the relaxation response. The solution to a panic attack is already inside of you. Comforted yet? We’re getting there. You are not defective; your mind and body are not betraying you. In fact, the opposite is true. Your mind and body are functioning perfectly during a panic attack — perfectly in response to stress, real or imagined. A simple skill called mindfulness. How simple is mindfulness? In the most basic form, mindfulness is the focusing of your attention with the goal of diminishing simulation. To enhance the effect of mindfulness and engage your relaxation response fully, deepen and slow your exhalation and pull your next breath in deeply using rise of your belly to expand the bottom lobes of your lungs. For eight breaths focus only on the sounds of your breath, the feeling of your belly rising and the sensations everywhere in your body — without judgment or analysis. Simply begin to notice what you are feeling. Eventually your mind will quiet itself, and begin to wander less. Through the practice of mindfulness, you will learn how to not jump on the endless freight train of thoughts produced by your wonderful and imaginative neocortex, so you can remain still, calm and at peace. Have panic attacks become a frequent, maybe even debilitating part of your life? You may have panic disorder — and you’re not alone. Nearly six million American adults suffer from panic disorder. One of Washington DC’s leading psychotherapy and anxiety counseling practices, Keith Miller Counseling & Associates, can help you unlock the potential of your mind and body’s relaxation response. Engage in Mindfulness in Washington DC. Disengage from Stress & Anxiety. When someone mentions ‘the city that never sleeps’, you think of New York City, right? Of course you do. A nickname coined, and made famous by the Martin Scorsese film New York, New York (and with a little help from Frank Sinatra), it’s one that could just as easily be used to describe, well, the world these days. Everywhere I turn, there are lights flashing, and sounds sounding; and everyone is rushing. It’s really no wonder more and more Americans are struggling with feelings of stress, anxiety, and depression. But I’m here to tell you there is a way out. You can surmount these feelings of angst, and it may be easier than you think. Exchange mindlessness for mindfulness in Washington DC. The practice, or process of achieving mindfulness usually involves meditation, and has been shown to offer a variety of health benefits, including improved sleep and decreased anxiety. But mindfulness is a practice. To reap the rewards, you must set aside time every day; forgo a bit of productivity and practice being mindful, not mindless. When I mentioned forgoing productivity, you twitched a little, didn’t you? We’re all so busy, and so busy trying to be so productive, we’re largely forgotten what it means to just be… still. Mindfulness doesn’t require hours of your time to be beneficial. In fact, the best piece of advice I can give you is this: Start small. Set aside a few minutes at the start of every day to reflect on the bigger picture that is your life, and to be grateful, and calm. It’s true what you hear, that foods high in fat and sugar can have a negative impact on your emotions and well-being. When you choose to eat healthy instead, you’ll have chosen to power your mind, as well as your body. Turn the television off; put your laptop away, skip the trip to the Beauty Salon. Think instead about the meal in front of you, and the flavors. Savor each bite, and truly give thanks to the food, and all who took care to bring it to your plate. The practice of mindfulness may be a solitary, introspective one, but as you embrace the stillness and the calm, know that time spent improving your inner self will also improve the way you interact with those around you. Think of the ones you love; thank the ones you love; help, and give to the ones you love. And soon you’ll find yourself refreshed, newly engaged, and mindful. Keith Miller Counseling can help you be more mindful in Washington DC. 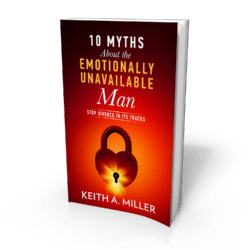 Contact Keith Miller Counseling & Associates today, and let’s discuss how psychotherapy in Washington DC can help unburden you from stress, anxiety, and depression, and feel more mindful in the process.